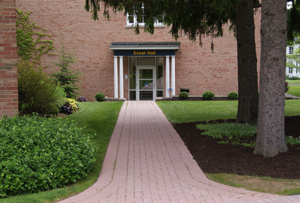 Eckel Hall houses a computer lab, classrooms, natural and physical science laboratories, and the Peterson Greenhouse. The science labs in Eckel Hall were renovated during the summer of 2014. A donor-funded project and one of the campaign priorities of Building Futures One at a Time: The Campaign for Cazenovia College, the Science Labs renovations included redesigning the layout of instructional fixtures, upgrading electrical and mechanical systems, installing support for new technology and equipment, and improving chemical and specimen storage. Demolition of the second and third floor labs began on June 5, 2014; the second floor labs opened for students on August 26, 2014 and the third floor labs followed soon after on September 2, 2014.